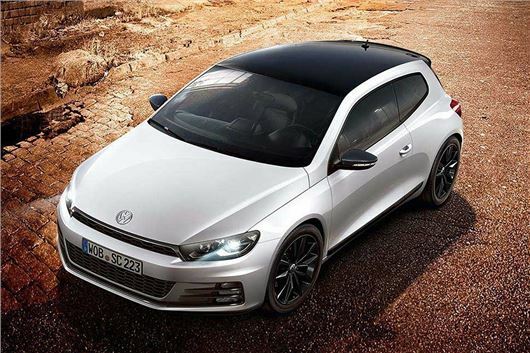 Volkswagen has introduced new Black Edition variants of the Scirocco, based on the GT and R-Line trim levels. Both come with black alloy wheels, a black roof, black door mirrors and a black spoiler, plus 90% tinted rear glass. Prices start at £23,135 for the GT Black Edition. This gets 18-inch alloy wheels, a 6.5-inch colour touchscreen, Bluetooth, DAB radio, USB connection, air-conditioning, automatic lights and wipers and an auto-dimming rear-view mirror. R-Line models gain R-Line specific exterior styling, larger 19-inch alloy wheels and electrically adjustable sports seats trimmed in leather. Both versions are offered with a choice of 1.4-litre 125PS or 2.0-litre 180PS petrol engines, plus 2.0-litre diesels with either 150PS or 184PS. Order books are open now and first deliveries of Black Edition variants are expected in January 2016.